Hortonworks filed their S-1 last week. Reading through the document, I noticed the company had quite a substantial fraction of professional services revenue; 41% of trailing 12 month revenue is services. Of the companies we have studied in our S-1 analyses, Hortonworks generates more professional services revenue as a fraction of total revenue than any other company. But, many companies do book a meaningful amount of revenue from professional services. 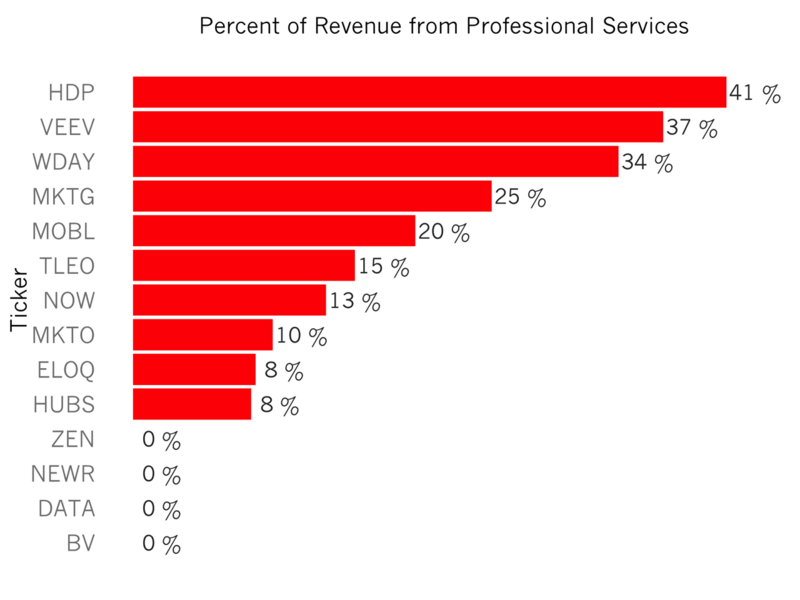 The chart above shows Veeva, Workday, Responses and MobileIron each generate 20% or more of their revenues from professional services (PS). Typically, professional services revenue isn’t valued very highly because there’s no leverage in this model. To increase revenues, a PS-heavy company must hire people to perform the work, so revenue is a function of hiring pace. Consequently, these companies trade at smaller multiples than pure software companies. For example, Accenture, one of the world’s largest consulting companies, trades at 1.6x revenues. Contrast this multiple to a basket of the fastest growing SaaS companies which trade at 12x. The difference in valuation afforded to companies which grow revenues by leveraging technology rather than growing headcount can be 10x! Some regard professional services as a necessary part of service large enterprises. The chart above proves the point. 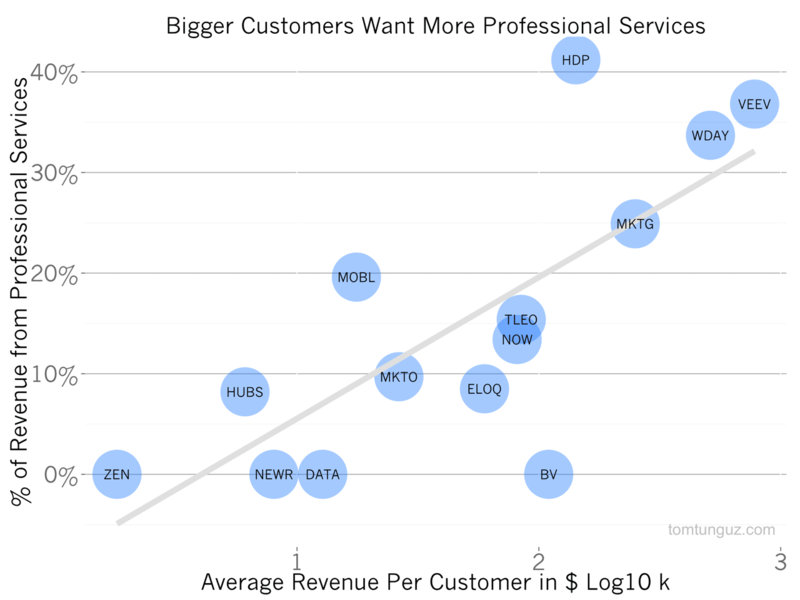 Compare the percent of revenue derived from professional services to the average revenue per customer (shown here in Log10 in thousands of dollars, so 1 = $10K, 2 = $100k, etc. ), and the relationship between the two becomes clear. In fact, the correlation is very strong at 0.72 R^2. In other words, the larger the average price for a piece of software, the greater the likelihood of business will derive meaningful revenue from professional services. This isn’t a surprise. Larger customers, who pay substantially more for software, have much more complex environments. In order for new software to flourish within an enterprise, the software most likely will have to be integrated into existing systems. This integration work constitutes the vast majority of professional services work. In addition, large numbers of customer staff must be trained to use the product, which also falls into the professional services bucket. Professional services isn’t a terrible thing for a business. Workday, which generates a third of its revenue from PS, trades at 25x revenue. The professional services fees, though, are heavily weighted to initial integrations and should dissipate over the course of a customer’s lifetime. So, in 10 years time, the vast majority of Workday’s revenue should come from software. Companies that rely on ongoing PS to create value for their customers, like Accenture, won’t be afforded the same multiples. There are many ways to build a massively successful SaaS company. Some companies, like New Relic, Zendesk, and Tableau do this purely through software. Others like Veeva, Workday and Responsys combine software with professional services. The larger the customer account, the more likely professional services will be a significant fraction of a company’s revenue. The key for founder is to ensure that at some point, professional services fees per customer declines with time and the company can leverage technology to retain to expand its revenue.